Mar. 21 (NBD) – With unattended long hair and beard, and wrapped in worn clothes, he looks just like any regular homeless people that you see elsewhere. However, the scruffy man has become an unlikely Internet celebrity in China. Over a week ago, videos of him talking about traditional Chinese classics, company management and regional anecdotes went viral online. The sharp contrast of his homeless life and his vast knowledge struck people's curiosity. 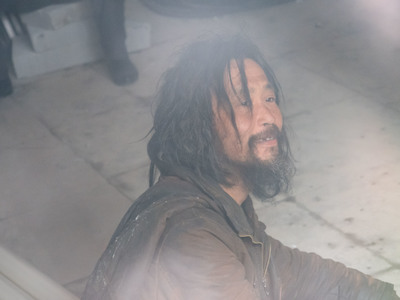 His name is Shen Wei, a Shanghai native who has been wandering on the street for 26 years. Before the street life, he attended college and worked as public servant at a district audit office in Shanghai, according to Hongxing News. At 2 a.m. every day Shen starts collecting garbage at several spots, then takes a nap at 5 a.m. He would read books at a nearby subway station, then find a place to sleep. Art, history, literature, and so on, Shen reads all kinds of books "like an addict". But he is not very into science and technology books that he finds hard to understand. People flocked to his hang-outs after watching those videos. Some came to exchange ideas with him on various topics, while some simply wanted to exploit his sudden fame. The two habits of Shen, collecting garbage and reading, started early. He loved reading since childhood, but his parents didn't have the money to buy him books, so he started picking anything that could be sold to get the money. His father hated history books and painting that Shen loved. Under his father's pressure Shen majored in auditing in university, a decision he viewed as a lifelong regret. "If I had another chance, I would choose a job related to culture, not numbers," said Shen. He took the collecting habit to his auditing job after graduation in 1986. Newspapers, papers only printed on one side, and even papers in the bathroom bin looked useful to him. Someone complained about his peculiar behavior to his superiors, who suspended his job in 1993. "They thought something was wrong with my head," said Shen. The audit office, though, denied that they drove him away. The suspension was the beginning of his wandering life, and he welcomed it. He would go out early in the morning to read in bookstores, and then listen to traditional operas in the theatres in the evenings. Not bad, said Shen, yet his suspension and garbage collecting irritated his family and neighbors. After moving several times, he gave up on the idea of a fixed shelter and lived on the streets for good. "I am very adaptive. I can fall asleep as soon as I lie on the street," said Shen. Finding food is no problem either. In his opinion, food is the easiest thing to collect, as well as the most wasted and underappreciated thing in today's society. Shen usually eats vegetarian food. He has a photo of Mahatma Gandhi, who he admires highly, in his secondhand cellphone. "I voluntarily chose to live a Sadhu life. Not bragging, but this is the kind of life I love." To this day, Shen still doesn't understand why collecting garbage is something to be mocked and ridiculed. He full-heartedly wants to contribute to the reduction of garbage. "I won't give up collecting garbage. I have done nothing wrong". Shen does not need money or food people have offered to him. Neither does he want the uninvited attention since he cannot find a quiet place to continue his reading routine. "I received a Confucian education since childhood, and I wanted to be a politician. Honestly speaking, I want to become a government official." Shen said.